Would be very tempting to a few brookies. Karel...nice job. I look forward to seeing them up close. 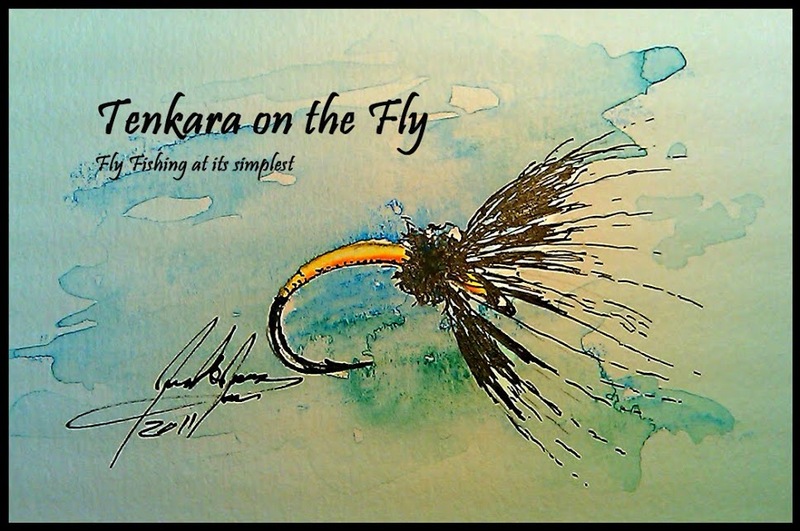 The Royal Coachman wet fly was my inspiration for my royal sakasa kebari. I like your take on it. I think someone else is also doing a Royal Wulff inspired fly which I look forward to seeing. By the way, I just received a gift of a "Tenkara on the Fly" T-shirt from my wife. It will be with me on my next trip to the stream. good lookin fly - i too tied a fl that traditionally would have calf tail - but I just couldn't get the result (calf tail fibers were too large in diameter) that I wanted so I went to snowshoe hare foot fur and it worked out pretty good. What kind of hackle? Brk Trt - thanks, this is high praise from an accomplished tier like you! Kiwi & Anthony - thanks, I am looking forward to see your flies soon, I was almost finished with my batch when I realized that the three of us had somewhat the same idea. It will be interesting to compare each other's adaptations. The hackle I used is brown barred hen hackle I got a while back to tie collars for the Killer Kebari. I should have thought about snowshoe hare... I got some laying around somewhere! Kiwi - hope you enjoy the t-shirt and that it will bring you some luck!